Cara Thompson (Royal Dornoch) made the long trip down from the Highlands to Fife worthwhile by returning an excellent score of three-under-par 70 over the Eden Course to be the clear leader at the end of the first qualifying round of the Strathtyrum tournament at St Andrews. She shot three strokes lower than anyone else at the Eden course. 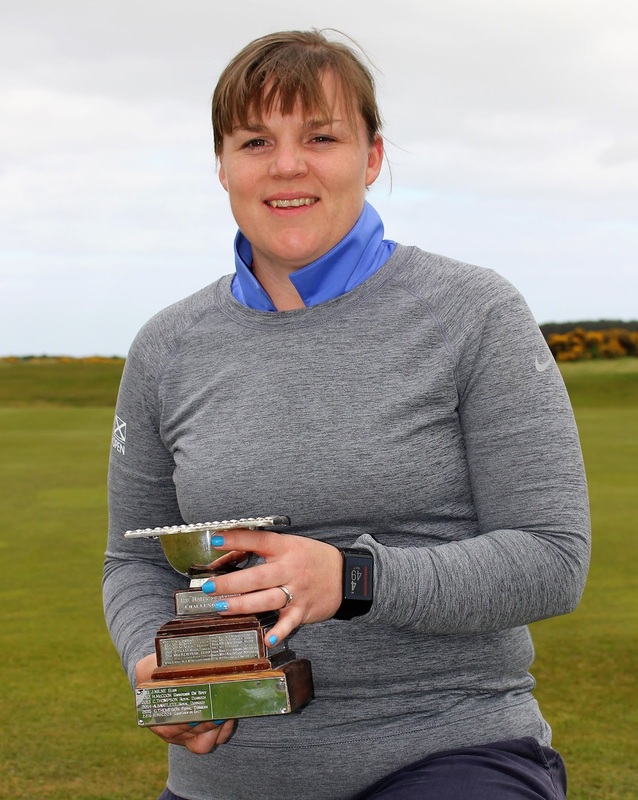 Jennifer Allan (Glenbervie) led the way at the par-75 St Andrews New Course with a 77. The big international field will switch courses tomorrow (Tuesday). At the end of play, the qualifiers will be known for the scratch and handicap match-play stages. +Cara Thompson is pictured with the Northern Counties championship trophy which she has won many times. 76 M Helgers (Netherlands), E Baxter (Houghton-le-Spring) . 80 L Wilson (Kelso), J Mackie (Ladybank). 81 E Marshall (Baberton), L Church (Henbury), W Nicholson (Baberton). 79 M Henderson (Royal Belfast), H Kitson (Cranleigh), M McAuliffe (Ballybunion). 83 A Gingdal (Swe), C Ryder (Prestbury), C Houghton (Notts).